What Day Of The Week Is November 21? 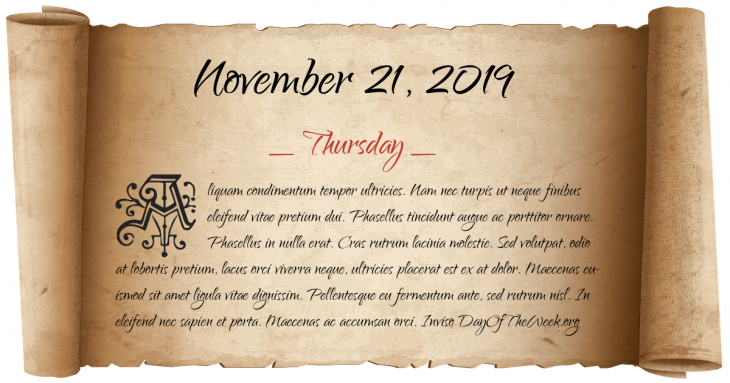 November 21, 2019 is the 325th day of the year 2019 in the Gregorian calendar. There are 40 days remaining until the end of the year. The day of the week is Thursday. Plymouth Colony settlers sign the Mayflower Compact (November 11, O.S.). Two Canadian National Railway trains collide in northeastern British Columbia in the Canoe River train crash. Twenty-one people are killed, seventeen of them Canadian troops bound for Korea. The Verrazano-Narrows Bridge opens to traffic (at the time it is the world’s longest suspension bridge). A deadly fire breaks out at the MGM Grand Hotel in Paradise, Nevada (now Bally’s Las Vegas). 87 people are killed and more than 650 are injured in the worst disaster in Nevada history. Antonio Salinass in San Juan, Puerto Rico kills 33.
Who were born on November 21?